Rory McIlroy tried to look on the bright side but after three great days at Riviera he undid all his good work with a disappointing final round 75 in the Northern Trust Open. The world No 3 finish the week tied for 20th on six under par, nine strokes behind winner Bubba Watson as Pádraig Harrington also shot 75 to slip 26 places to tied 45th on two under. McIlroy was just two shots off the pace starting the day but after making an eagle three courtesy of a 23 foot putt at the first to grab a share of the lead, there were no more positive numbers or memorable putts to celebrate until he finished with a birdie three at the 18th. Tee-to-green it felt pretty good," McIlroy said after bogeys at the fourth, sixth, seventh, 11th, 12th, 13th and 16th. "One of those days, I couldn't really get anything going after the good start." The bogeys at the third and seventh came from three-putts and there were other short misses at the 11th (4 1/2ft) and 13th (6ft) in a 34 putt round. "I was 12-under after the first hole today, if I played a solid round of golf after that, you have a great chance. I let a few shots slip away. "The 3-putt on 4, put it in the bunker on 6 and really couldn't get it up-and-down there. 3-putt on 7, just mistakes like that you shouldn't make. They are the mistakes I made and that's what cost me today. "I felt like I played three solid rounds of golf and didn't make many mistakes. I was very solid in that department. Today I just, yeah, I just couldn't really get anything going." McIlroy promised to make Riviera a regular stop on his schedule going forward but he will be disappointed not to have survived a little longer on Sunday. "It's been fantastic," he said. "I really enjoyed it. This is definitely going to be a regular for me on the schedule going forward. I really enjoyed it so much. "The golf course is great, but the area, staying in Santa Monica and having the beach there, there's so many great things to do. Glad I played this year and I'll definitely be back. "There's encouraging signs, but I turned a chance to win into a Top-20 at the end of the day, so that wasn't too good. "I'll have a nice day off tomorrow, regroup and get ready for next week and hopefully put myself in contention again." 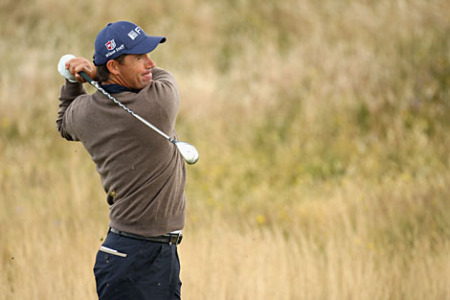 Harrington's hopes of a decent finish were scuppered when he followed a birdie at the first with bogeys at the third and sixth and a triple bogey seven at the seventh where he tangled with a fairway bunker and then three-putted from just inside 40 feet. Victory went to two time Masters champion Watson, who was two shots behind with four holes to play but birdied the 16th and 17th to card a 68 and overtake Jason Kokrak and hold off Adam Scott for a one-shot victoryWatson. It was his second win in the event in three years and his ninth on the PGA Tour, moving him back to No 4 in the world rankings. According to reports, Watson took advantage of some late mistakes by Kokrak, who was going for his first PGA TOUR victory, and his two birdies were enough to turn back the late heroics of Scott, who chipped in for birdie on the 18th for a 67. The decisive moment came at the par-five 17th, where Watson jumped out of his shoes with his tee shot and reach the green in two with an iron before two-putting for birdie from about 40 feet as Kokrak hooked his tee shot into the trees and had to scramble for a par. Watson was understandably thrilled to win. How does it feel to have won at Riviera for the second time? BUBBA WATSON: It feels nice. Any time you can win, being in that situation before here and pulling it out, it's kind of the same shot that I had on 18. I hit wedge and 14 I hit 9-iron today, so it was the same kind of shot, and it worked out. Q. What was the secret to your performance? What was the thing that stood out that you did really well? BUBBA WATSON: Being patient. Made some mistakes but I stayed patient. I stayed committed and that's what we're working on. The last five years of my life on the golf course and working on the head game. The physical game is there. It's just staying patient, focusing on one shot at a time and staying committed. Q. There's been a lot of talk of Big Four in golf, and you with this win will move up to the 4th spot. How big is it to be part of that scene in the world of golf at the moment? BUBBA WATSON: It's good. Any time you're Top-50 in the world it's nice and when you move up farther, it's even better. Q. Your second win here at Riviera in three years, what is it about this place that just resonates with you? BUBBA WATSON: You could hit shots around here. You can use your imagination. I hit some big hooks. I hit some big slices and it worked out. The key around here is just making your putts and for me it was about -- the same thing I did on 14. I was so committed on staying focused on the putts that I didn't let the other stuff distract me sometimes. Q. From an outsider looking in, that was one of the most mature performances of your career. What other words would you use to describe it? BUBBA WATSON: Not sure that word you just used, but you know, like I've always said, the last five years have been really tough. The physical game is not the problem. It's the mental, and it's staying focused. It's staying focused on each shot. I'm thinking about dinner, I'm thinking about basketball games, I'm thinking about -- nobody knows this yet but I passed a kidney stone at the golf tournament on Monday. It's focusing on the golf shot. Last few years been working on it, slow process, but hopefully I'll get better at it. Q. When you won here two years ago, seven weeks later, you went on to win the second green jacket. That was two years after the first one, and you go in there now two years after the second one; how high is your confidence? BUBBA WATSON: My confidence is always high. It's my mental game that's always down. I knew I was playing well. In Phoenix I had a bad headline that a lot of people booed me but still finished 14th there with all that going on. I knew that my game is in the right spot and I just hope it stays that way and really the head is in the right spot. If this is a taste of what’s to come, roll on the Masters. Ten players ended up within three shots of the lead heading into the final round of the Northern Trust Open at Riviera and it’s a who’s who of the game’s best with Rory McIlroy’s clutch 18 foot par save at the 18th — he'd missed the fairway and green right — vying with Bubba Watson’s up and down from near a concession stand just a few minutes later for shot of the day. Padraig Harrington undid his hard work over the first two days when he crashed out of contention with a four over 75 in the third round of the Northern Trust Open at Riviera. 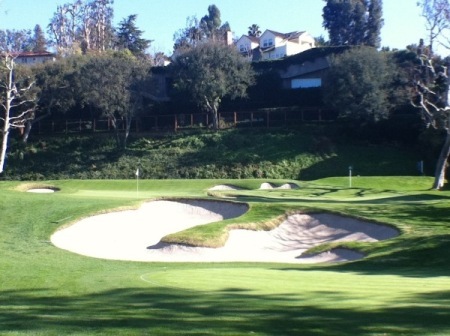 The 6th at Riviera via www.geoffshackelford.comPadraig Harrington struggled with his distance control and failed to finish his round as darkness forced play to be suspended in the opening round of the Northern Trust Open at blustery Riviera. Chasing a victory that would catapult him back into the world’s top 50 and qualify him for the WGC-Cadillac Championship at Doral in a fortnight, the Dubliner was one-over par and six shots adrift of clubhouse leader Phil Mickelson as he faced a six foot par putt on his 17th hole (the eighth). Pádraig Harrington made a brave bid to make the cut but came up short as two bogeys in his last three holes undid all his good work in the Northern Trust Open.